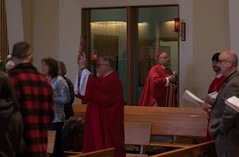 The last week in April, I had the privilege of participating in a very special celebration at Saint John by the Sea Parish on Prince of Wales Island. The Parish celebrated the twenty fifth anniversary of the dedication of its Parish Church in Klawock; and also the Confirmation and First Holy Communion of Wendy Hulstine, an adult member of the parish. After months of preparation by Father Ed Penisten and a host of parishioners, we celebrated a Mass that included much of the original music, as well as many of the original people, who had been at the Dedication Mass twenty-five years ago, at which Bishop Michael Kenny presided. This was followed by a remarkable prime rib dinner at which memories of the early days of Saint John’s Parish and the building of the Church were freely shared. Special attention was reserved for the memories of Father Jim Blaney, O.M.I., and Sister Laetitia “Tish” Lariviere, I.H.M., the Pastor and Pastoral Associate of Saint John’s at the time the Church was planned and built. Indeed, Sister Tish had died at her home community in Michigan just two weeks before the celebration took place, and pictures and news accounts of her ministry at Saint John’s were prominently displayed. 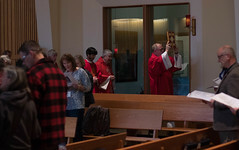 At first glance, the celebration of Wendy’s Confirmation and First Communion might seem a little out of place as part of the Anniversary Mass of Saint John’s dedication. After all, the Church’s dedication was a very public event that took place a quarter of a century ago, the culmination of a planning and construction project in which many dozens of people played key roles in producing a highly visible material structure. Wendy’s reception of Confirmation and First Communion took place just last week after a long process of discernment and spiritual growth that has had its main effects in the hidden recesses of her heart, and in which she was accompanied by a rather small number of family members and friends. Despite these superficial differences, however, there is a profound relationship between these two events that gives their combined celebration a meaning and impact that might have been lost if they had been celebrated separately. Spirit and by receiving the Body and Blood of Our Lord. As a result, God now dwells in her in a special way that can lead her to a relationship with Christ that may grow deeper and deeper throughout her life in this world, and reach its fulfillment in eternity. For Wendy herself, the benefits of this relationship are wonderful and infinite. But the benefit of this new relationship with God is not meant for Wendy alone. Rather, by the consecration and sanctification she has received through these Sacraments, she has also been called by God to her own unique role in the salvation of the world—her vocation. In the concrete circumstances of her life, Wendy will be called to serve God and God’s people in ways that the Lord has foreseen from all eternity. Although Wendy’s consecration and vocation are as unique as her individual relationship with God, she does not experience them in isolation, but rather in the context of a Church community. For Wendy, that community is Saint John by the Sea Parish. It is as an individual, but also as a member of that community, that Wendy has been led to this stage of her spiritual journey and will continue on that journey as she continues to respond to her call from God. And this is where we find the connection between the celebration of Wendy’s full membership in the Church and that of the anniversary of the dedication of her Parish Church in Klawock. Saint John’s Parish Church is one of the most beautiful and functional of all the Church buildings in Southeast Alaska. It reflects a labor of love in its construction, maintenance, and enhancement, and offers a haven of quiet peace to all who visit it. But the significance of a Parish Church cannot be limited to its appearance, its prominence, or its attractiveness, as important as these might be. Saint John’s Parish Church is, more importantly, a sacramental sign of the Parish community that it houses, and ultimately it was this community that we celebrated at that Anniversary Mass. The material structure of a Church building is made up of many unique parts, just as a Parish community consists of many unique members. Each of these parts—like each of the members of a Parish—is important to the whole. If a part or a member is missing, the Church building or Parish community will, to that extent, fall short of its potential. At the same time, something that is meant to be part of a Church building misses its purpose unless it is actually incorporated in that building, just as a person who is called to be a member of a Parish community will be held back from the fulfillment of his or her vocation if he or she fails to participate in that community. Through the power of the Holy Spirit acting in its members, each with his or her own vocation, a Parish community becomes the Body of Christ still active in this world. The Parish Church building represents that Body of Christ, and serves as the location for the most significant actions of Christ and his Spirit through that community. Thus, by combining the celebration of Wendy’s Confirmation and First Communion with that of the anniversary of the dedication of her Parish Church, we were really celebrating one reality: the action of Christ made present through his Spirit in the lives of his individual disciples brought together in their Church community. The different parts of the celebration each highlighted a different aspect of this reality. In the celebration of Wendy’s Confirmation and First Communion, we focused on her unique individual relationship with God and vocation to carry out her singular role in the work of salvation. In the celebration of the Parish Church’s dedication twenty five years ago, we highlighted the incorporation of Wendy and all the members of Saint John’s Parish in a community that is necessary to the full growth of their relationships with God and fulfillment of their vocations. Indeed, we can say that each parish or mission community in our Diocese and throughout the world, like every individual Christian, has its own unique relationship with God and its own unique vocation—to make Christ present and active in a particular time and place in human history. While celebrations like that at Saint John’s take place only once in a long while, they serve to remind us that the realities they celebrate are always present in our lives. In order to live those realities fully, it is essential that we participate regularly in celebrations of the Eucharist and of the other Sacraments that, while more frequent, are no less significant. In these celebrations, we not only recall from a distance events of the past, or simply rejoice in events of the present. We participate in those events as members of Christ, reminded by the beauty of our Parish Churches that it is only joined together in him that we can experience the fullness of our lives and of his glory.